How to dive from small inflatables to giant live-aboards. Safely enter and exit the water. Stow your gear in the most appropriate areas. Use surface lines to initiate or conclude your dives. Locate basic boat safety equipment. 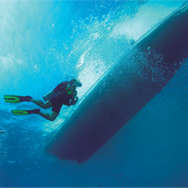 The course consists of two dives. If you have done the boat dive as part of the Adventures in Diving program that dive may count as the first dive of this course.